I have decided to put together Shad on the Fly to create a website dedicated to fly fishing for shad, partially to help educate other fishermen that may be just starting to flyfish for this wonderful fish, and partially to help me aggregate the things I learn for my own use. It seems that each year when the shad start running, I learn something new as well as forget something I have learned in the past, and that forces me to go back and search again for what I am seeking. While I am far from an expert, I would like Shad on the Fly to become a repository of knowledge on the subject of fly fishing for shad, and I hope it will help anyone wanting to become a better shad fisherman. I have been fly fishing since 2010 and have become addicted to the sport. My love affair with fly fishing started just before my honeymoon to Belize when my wife and I decided to take a casting lesson. We both enjoyed angling (me more so than her really,) and after booking our trip to Belize, we found out that Belize was a premier fly fishing destination. I bought an 8 weight TFO Lefty Kreh outfit from Bass Pro, instantly became enamored with casting and practiced daily for several weeks before our trip. By the time we left for our honeymoon, I had learned to double haul decently enough, and was able to successfully catch my first fish on the fly during our stay… the mighty bonefish! I was instantly obsessed and enjoyed catching more than 30 of them during our stay in Belize. While the bonefish has a special place in my heart (and frequently my dreams) and south Florida does offer fisheries where bones thrive, the logistics of travel and guides mixed with the responsibilities of family and career limit my time hunting for the silver ghost. The good news is that I have found a fish that makes a yearly migration, essentially to my front door, that allows me to focus, fixate, and otherwise “dork out” for several months of the year… the Shad! 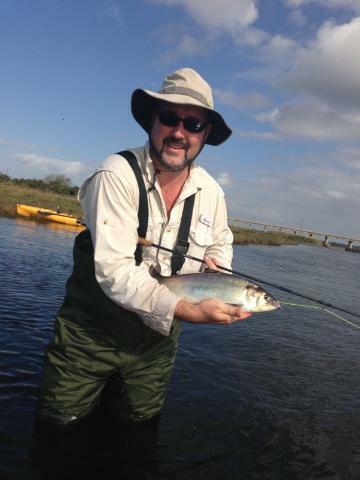 I started fly fishing for shad on the St. Johns River in Central Florida just a couple of months after returning from Belize. The guys up at Orlando Outfitters were kind enough to help me with flies, kayak accessible launches, and tactics. Since then I have come to love the yearly ritual of anticipation, reading, learning, fly tying, and finally fishing for this wonderful fish. While my contribution to this site will be primarily based around shad fishing in Florida, the tactics, techniques, and flies will most likely work in other places. That said, if you are an avid shad fisherman and would like to contribute, please feel free to comment on posts, join the Shad on the Fly Facebook Group, and let me know if you are interested in becoming an author on this page. My name is Philippe and I run the OKFC, Orlando Kayak fishing Community. https://www.facebook.com/groups/OKFC1/ . I came across your site which has some great info that I can share with the 1000 + members of our locally based community. I am doing several Shad runs this month with friends. If you want to join in sometime LMK. Luc Desjarlais, the Author of “Wadefishing for Shad on the upper St. Johns” will be our speaker at our January 7th meeting at Orlando Outfitters which is open to all who are interested in shad. If you come to the meeting please introduce yourself. Thanks for the correspondence! I have been an OKFC member for quite some time (old screen name was “chola”) and would definitely be happy for you to share the site with other members. I do not get to attend many OKFC meetings due to schedule, but did attend last year’s meeting with Mark Benson and we met briefly. I am planning on attending the meeting on January 7th (by the way, that reminds me that I need to write a review of Luc’s book) and will definitely introduce myself. I would definitely enjoy meeting up during the run this year! Great site loaded with information. I can clearly see where your passion lays. You might consider adding a form so others with the same passions can communicate. I would also like to hook up and fish with you sometime. Here is a link to a blog I wrote on shad fishing: http://www.irl-fishing.com/blog/2015-11-10-fish-heaven. Thank you! I have been a subscriber of your IRL Fishing Forecast newsletter for quite some time but did not realize that you also had a blog. I will add a link to your blog on this site. I would definitely like to hook up and fish with you sometime soon! I finally created a Shad on the Fly Facebook Group. I hope that you will join!